How did you find out about projectABLE? I found projectABLE a fantastic & life-changing experience that enabled me to gain further understanding of working with people living with disabilities & an overall insight into employment in the disability/community sector. Fortunately, my school coordinator Head of Social Justice, told me about this voluntary excursion to the Cerebral Palsy Alliance in Allambie, partnered with projectABLE. What was it that attracted you to do the program? 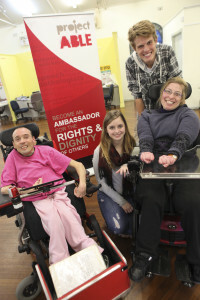 The attraction to the program was that I wanted to know more about understanding the needs of people with disabilities. It frustrates me that in this multicultural country, we commonly forget that it includes people with disabilities. How did projectABLE challenge your perception of disability? ProjectABLE dramatically challenged my perception of “disability”. Initially I wasn’t sure what to feel, whether to have sympathy or to be empathetic. Although I learnt that just because you might have a disability, you still should be treated with dignity and be given respect just as you would anyone else. People with disabilities have passions and interests & you should always view the person before the disability. Would you recommend your friends to take part in projectABLE? I would definitely recommend my friends to take part in projectABLE as it enables oneself to try to understand what it’s like having a disability and understand what jobs there are in the disability sector, although it might be challenging it is so rewarding. projectABLE allowed me to use my skills, particularly that of communication in order to actively participate in the care and assistance to the people in this sector. I think if you wanted to work in the sector, it would be a great starting place. After doing projectABLE, what are the next steps for you? Would you consider working or volunteering in the sector? From working with projectABLE, it really has increased my awareness of the opportunities & employment in the disability sector, especially since I’m completing my HSC. I would definitely consider working in the disability sector, perhaps even studying speech pathology. What was the overall highlight for you? The overall highlight of the projectABLE experience was leaving the practical workshop with a great sense of achievement and knowing that I had made someone smile for that day. I might have not been the best dancer, but I might have given a few people a good laugh! What was the hardest part of participating in the program? The hardest part of the program was keeping within the guidelines of the work relationships with the clients. It is very easy to become attached to the people that you work with. However, if you were unsure how to handle any situation, there are always trained people to speak to if you feel uncomfortable. Where will projectABLE take you in 2014?